Phoenix-canariensis, Canary Island Date Palm is very slow growing, but a mature specimen is spectacular when you find one or more in the road median as you're driving by, or against a Spanish style home or building. They are quite amazing, sturdy and tall with a very tropical look, growing to 40 feet. This palm is hardy down to zone 8B through 11, making it more widely used than other more sensitive palms. They are moderately salt tolerant and very drought tolerant. Mature specimens grow with a single trunk up to 3 feet in diameter, topped by a canopy of up to 100 fronds. The trunks have a desirable diamond pattern created by scars from fallen fronds. Click the tree above or below to purchase high quality Canary Island Date Palm Trees in several available sizes. The best of the best. Mostly used outdoors as a garden focal point. A Canary Island Date Palm can not be mistaken for another palm. Its unique massive pineapple shaped trunk makes this a grand specimen. Also known as Phoenix-canariensis, Canary Date Palm, Pineapple Palm, or Canary Palm. 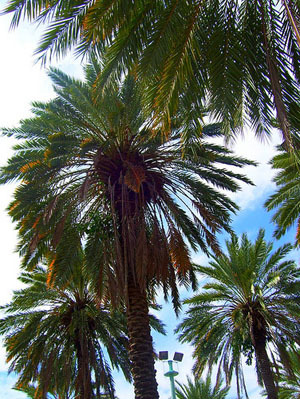 This date palm tree is easily recognized through its crown of leaves and trunk characteristics. When Canary Palms are pruned properly, the bottom of the crown, also called the nut, appears to have a pineapple shape. It's not uncommon to see Canary Island Date palms pruned and trimmed to enhance the appearance. The Canary Island Date Palm is a stately palm tree that hails from a group of islands off the coast of Africa called the Canary Islands. These date bearing palm trees have been adorning the most beautiful homes and businesses across the world with their majestic look. The Canary Island Date Palm comes from the Phoenix Lineage and hence is equipped with long sharp needle-point thorns that run along the leaf stem. The Canary Island Date palm stands by itself and needs no introduction. It is found in all the main resorts and cosmopolitan centers across any tropical or sub-tropical area. Canary Island Date palm is a wonderful specimen for those who want to make a statement. The Canary Island Date palm is very meticulous when it is a small plant, but when full grown offers a more stable easy-maintenance routine. As long it is watered every now and then and fertilized 3 to 4 times a year, Phoenix-canariensis, Canary Island Date Palm will grow to its massive stately size and crown its top with large 10 to 15 feet long deep-green leaves that spiral around giving the tree its rightful crown.